Estonia has islands of all kinds: remote and accessible, eerie and picturesque, heavily populated and with no people on them at all. Whatever your script demands, the country can provide. “If I were to sink my teeth into your eye right now, would you be able to stop me before I blinded you?” asked the warden. “Give it a try,” said Teddy Daniels. “That’s the spirit,” said the warden. Among the many creepy and memorable exchanges in Martin Scorcese’s “Shutter Island,” one of the most underrated flicks of the modern era, this one stands out. Claustrophobia creates intense movie situations, and where could one find a better setting for real cabin fever than on a remote island, miles away from civilization and mortal temptations? But the island doesn’t have to be isolated to shoot the perfect thriller–or any other movie–as long as it has the perfect scenery to get your maudlin juices flowing. Estonia has islands of all kinds: remote and accessible, eerie and picturesque, heavily populated and with no people on them at all. Whatever your script demands, the country can provide. There are over 2,000 islands in Estonia, with Saaremaa, Hiiumaa, Kihnu, Ruhnu, and Vormsi being the biggest and most popular. Saaremaa is the largest of the bunch, measuring a solid 1,032 square miles and accommodating over 30,000 people with a density of 30 per square mile. “A beloved child has many names,” as we say in Estonia, and so does Saaremaa. It’s called Øsel in Danish, Osel in English, Saarenmaa in Finnish, and Ösel in Swedish and German. The Estonian name Saaremaa means “isle land” or “island land.” Ancient Scandinavian sagas called Saaremaa Eysysla and Eysýsla, and some scholars believe it was probably the historic Ultima Thule— according to Greek and Roman literature, the place on the planet that is farthest north as shown in old cartography. Saaremaa also has countless hotspots, including the famous Kaali Järv, the first crater scientifically proven to be the place a meteor hit Europe. Another is the Panga Cliff, an ideal spot for walks or suicides, should your script require either one. North of Saaremaa, there’s Hiiumaa, another beloved child with different monikers: Dagö in German, Hiidenmaa in Finnish, and Dagø in Danish. 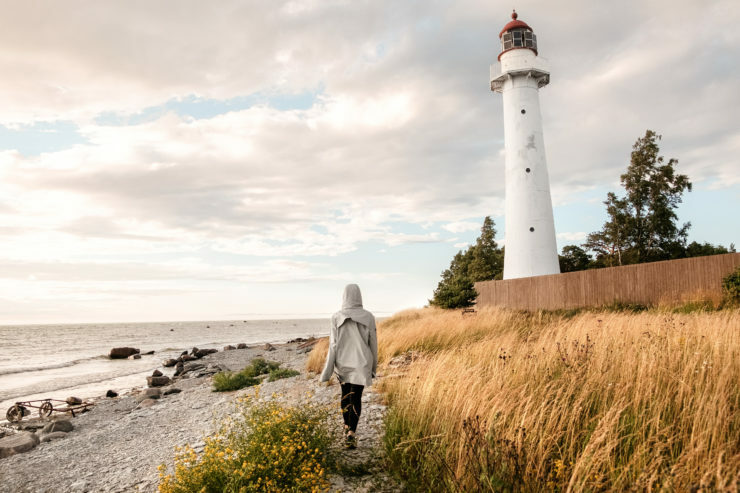 Hiiumaa is the second largest island in Estonia and somewhat less touristy than Saaremaa, which tends to attract enormous crowds, especially in summer. Archaeological evidence of the first human settlement in Hiiumaa dates to the 4th century BC, making it an obvious location for the next Braveheart (with more detail spent on actual history, one would hope). But by far, the coolest and creepiest Estonian island is Ruhnu. It’s as out there as you can get, taking an excruciating 4 hours to get to it by motorboat. Ruhnu Island, though, is served by the Ruhnu Airfield, which looks more like a golf course than an airport, but it is efficient enough to handle one weekly flight from mainland Estonia. So, yes, Ruhnu would make a perfect spot to film a prison break (especially if the inmates can swim). The island has a grand number of 97 people living on it, making it an even cooler place to shoot any film, really. “You’ll never leave this island,” said the sinister character George Noyce in “Shutter Island.” The same sentiment rings true about every one of the more than 2,000 islands in Estonia. Once you’ve seen them, you can never really leave.